Yesterday was the first day of serving our heroes at the Fisher House in San Antonio. The day started off slow, because it takes the Wounded Warriors and their families a day or two for the word to spread that the Angel Chefs are on Post. It was wonderful to see old friends that I had met the last time I served them, and meeting new folks who have arrived at Brook Army Medical Center within the last six months. Perhaps the most poignant story came from a soldier named Bo, who is a triple amputee. His dad is here in San Antonio supporting him, and had just received a phone call that pipes back home in Idaho had burst and there was extensive flooding. He was going to have to fly home to see to repairs. With no one to help care for Bo, he would be forced to give up his spot at Fisher House and move back to the barracks. After a phone call or two, a family friend who happened to be in Texas to go hunting, offered to stay with Bo so that his dad could take care of business. Bo is understandably dealing with a lot of issues, as are many of these young soldiers, but giving up his position at Fisher House would have been a huge setback. 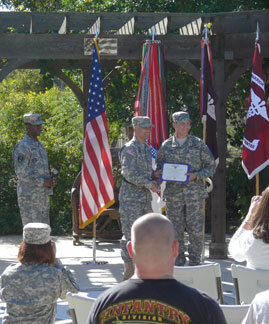 The highlight of my day was getting to observe a Purple Heart ceremony. A combat award, the original Purple Heart, designated as the Badge of Military Merit, was established by George Washington—then the commander-in-chief of the Continental Army – by order from his Newburgh, New York headquarters on August 7, 1782. 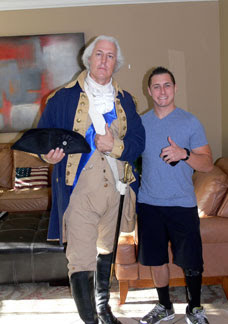 So you can image the thrill of wounded soldiers to see President George Washington approach them to shake their hand. Mark Collins, a Baptist preacher from Yorktown, TX has made it his calling to represent the honor and patriotism of the first President and Commander-in-Chief. He has appeared in the History Channel's "Revolution" series, depicting the founding of our nation, and is often called upon to portray our Founding Father in various presentations. As you can see by the following photos, his appearance at Fort Sam Houston was met with much surprise and excitement. Matching General Washington's height of 6'4", he is a commanding presence, and loves the opportunity to thank the troops for their service. 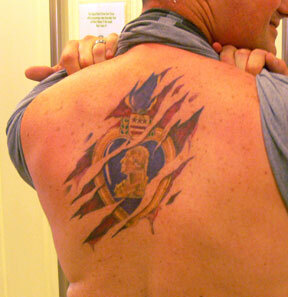 But the biggest coincidence of the day was the tattoo that Dan, one of our favorite residents at Fisher House showed off. The last time I was here, Dan had suffered a setback, re-injuring himself which forced him to lose the use of his prosthetic and return to a wheelchair. 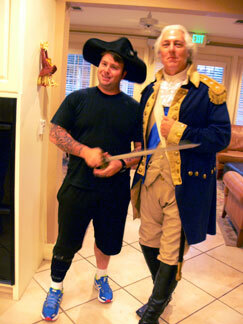 This visit, Dan had reacquired his new leg, and was sporting a new tattoo ..... one of his own design of George Washington. It was only fitting that he showed it to us on the day that the First President visited Fort Sam Houston. It's late, my feet are tired, and I can barely keep my eyes open. But I can't wait to go back tomorrow and be inspired by these true heroes. We owe them so much and it's my privilege to thank them in this small way. 2 Corinthians 4:15 "All this is for your benefit, so that the grace that is reaching more and more people may cause thanksgiving to overflow to the glory of God." Just wonderful! Thanks for the report and update so far in your week there. I wish I was there because it's so inspiring and I feel so thankful and I would just love to give everyone a big hug! THANK YOU TO EVERYONE. Believe me, we let them know that the American people appreciate their service and would all love to personally thank them!